Just one of those busy, unfocussed, weeks but I've been thinking "What next?". I have the urge to focus a bit so I can not only get some progress done on the maps and back stories of my campaigns and improve and expand the related terrain and get all the troops gussied up and looking sharp, but also tidy up the room and shelves. This implies cutting back on painting and gaming to find time and reducing the collections make room for neatness. Lets call this "Having the Cake". Too much glare on these converted and refurbished 54mm Highlanders. BUT..... I also have the urge to do more! Play some bigger games, get to some of those put-off-till-later things and play some different sorts of game. This then would be "Eating the Cake". In the meantime I noticed a stand of 54's that had been primed before Huzzah but not painted so I did that today and thought about making some guys in turbans to go with them. Oh well. There is nothing like having the troops hit the tabletop to help sort things out. I've been a little under the weather health-wise over the last week as well as having lots of yardwork to do so I didn't manage to finish painting the last batch of new figures until yesterday morning and didn't manage to play a game. However, I did manage to look at some (a LOT actually) of my old blog posts, mostly battle reports and rules ideas (a LOT of posts), as well as revisiting some old books while pondering just what sort of games I want to play. The Nordmark Naval Regiment marches onto its first battlefield. The answer was some fast flowing Old School games with a handful of battalions and squadrons. Something Tabletop Teaser-ish with more "General" than 'Sergeant Major" and with most of the friction coming from the enemy, the combat dice and the player's mistakes. That confirmed my earlier decision to break out Hearts of Tin (HofT). Having realized that I'm in the mood for some traditional Old School type games I decided to do a straight encounter between opposing forces each having a Cavalry squadron, a light infantry battalion, 3 infantry battalions and a gun. Turn 4. The Maritime Federation gets there first with the most thanks in part to a chance card which stalled the Rosmark road column for a turn. Each side was able to bring on one unit per turn with a goal of controlling the town at nightfall. The game ended after 15 turns or if one side was forced to retreat by losing over 1/2 of its stands. 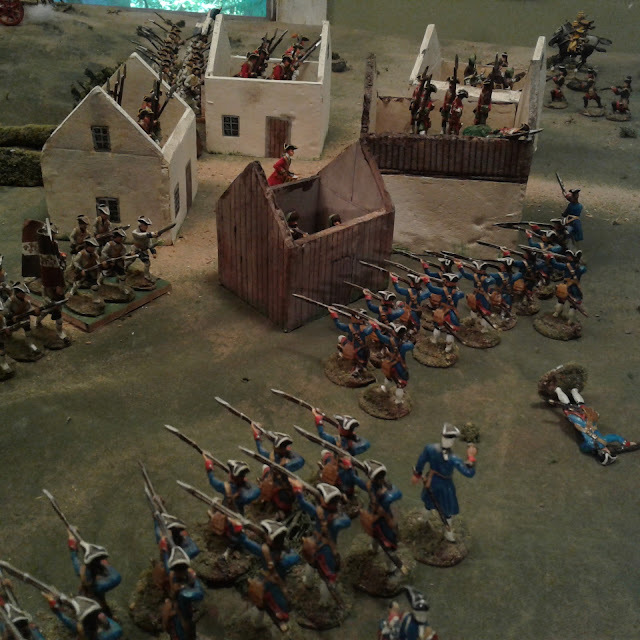 The Maritime Federation got the jump and aided by chance cards, occupied the town and then just had to repulse a series of attacks until just before dark when Rosmark's casualties forced the Rosish general to order a retreat. My new regiment, christened the Nordmark Naval Regiment, was steady in its first fight and repulsed several attacks, taking a casualty in the course of extended bombardment, musketry and fierce hand to hand fighting. Yes, "a" single casualty, lucky with dice apparently. 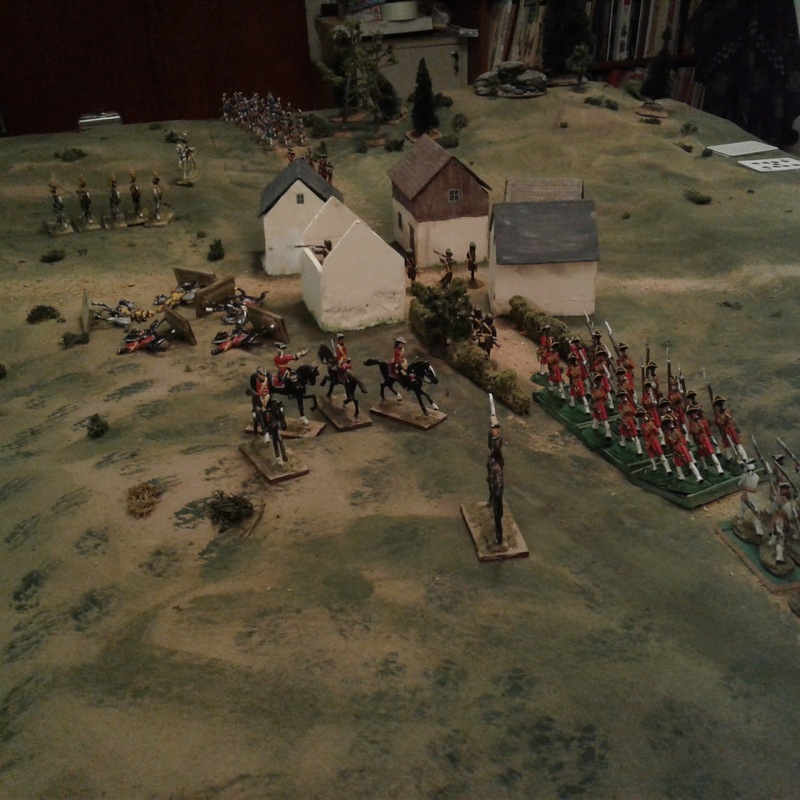 There were several fierce cavalry charges, much shooting and several assaults but the Rosmark forces never came close to evicting the Federation from the town and suffered three times the casualties. On turn 13 of 15, with Rosish forces on the brink of morale failure, I called it. Not only was it an auspicious start for the Maritime Regiment, it was also just the sort of game I had in mind, the kind that makes me look forward to playing more including the occasional big one. I'm starting to think again about cutting my table down to 4x5 again and getting a second board of the same size so I can set up a 5x8 for special occasions. Mid-game as the Queen's Foreigners prepare to assault. I was having real lighting issues and gave up trying to get use-able pictures of the rest. Before you ask, No, I don't have a written version of the rules, I went by memory and improvised when needed. I used a card deck for initiative (Red Federation/Black Rosmark) with the usual chance cards included. Units not within 12" of the General had to test when activated. 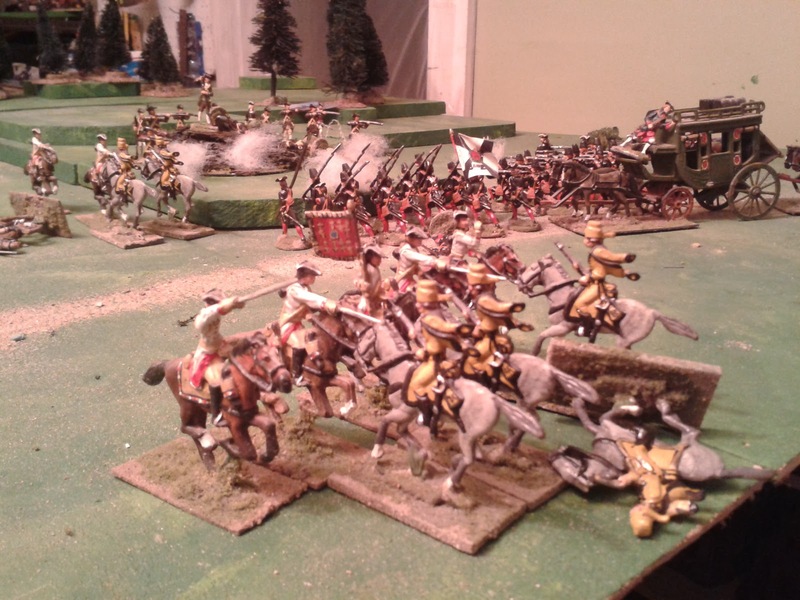 Movement was 12" if column or light infantry, 6" in line, 18" for cavalry. 1/2 move to change formation etc. Light infantry may move and shoot. All units except artillery were 3 stands strong and able to take hits equal to the figures (3 or 6). Firing was 1 die per stand for infantry with a range of 12", 2 for artillery with a range of 36". 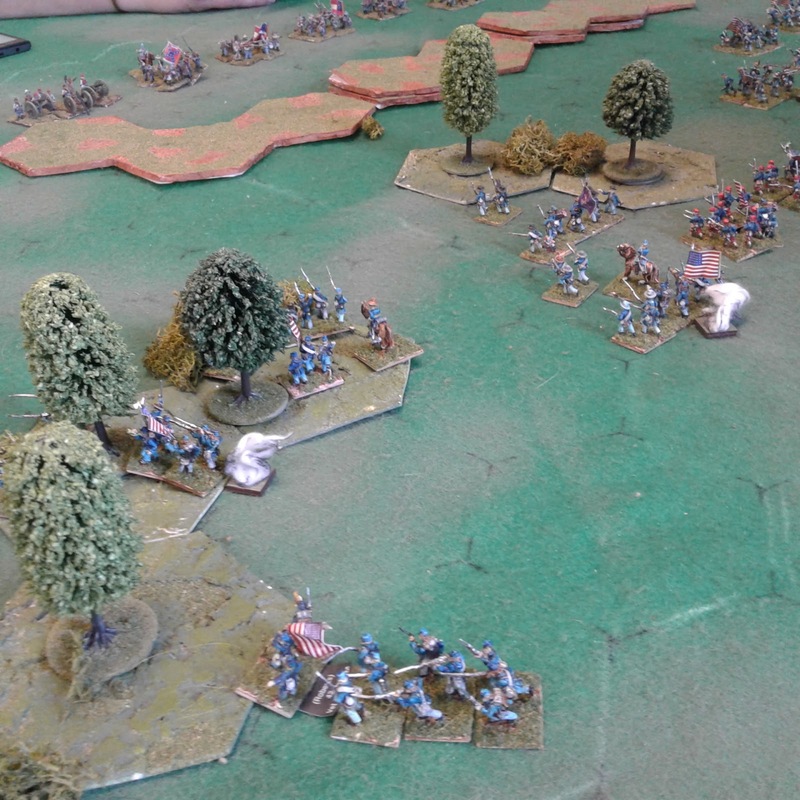 6's hit troops in cover, 5,6 hit cavalry, artillery and skirmishers in the open, 4,5,6 hit line infantry in the open. Melee and close range firefights (3") gave line infantry and cavalry 2 dice with both sides fighting and cavalry adding +1 per die if charging. A side in melee that took more hits than inflicted and at least 1 per stand had to retreat in disorder and spend a turn reforming. I need to get working on those magnetic stands, writing a good copy of the rules, working on the maps, backstory, personalities, and..oh my. This past week has been as slow hobbywise as the lack of posts suggests, however, I perked up today. This morning I finished painting the last 1/3 of my new Red coated, allied Northern Maritime regiment which has a vague resemblance to Lally's Irish. 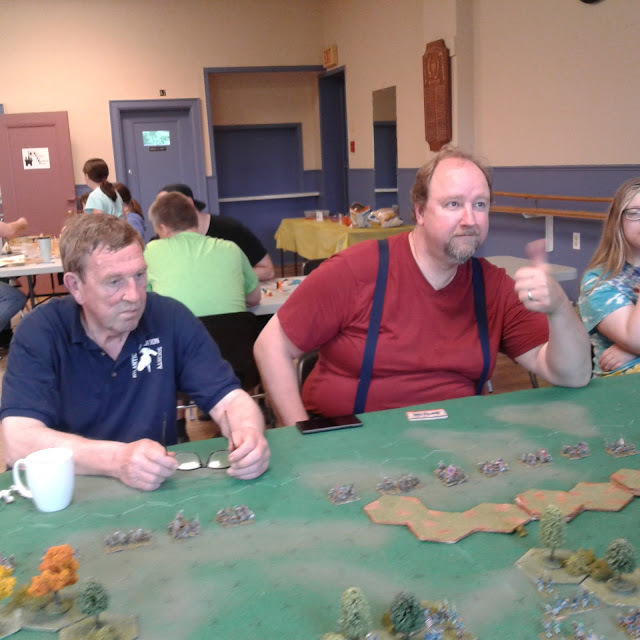 This afternoon I nipped down to Kentville to join in a 6 player Epic Battle Cry Bull Run game. 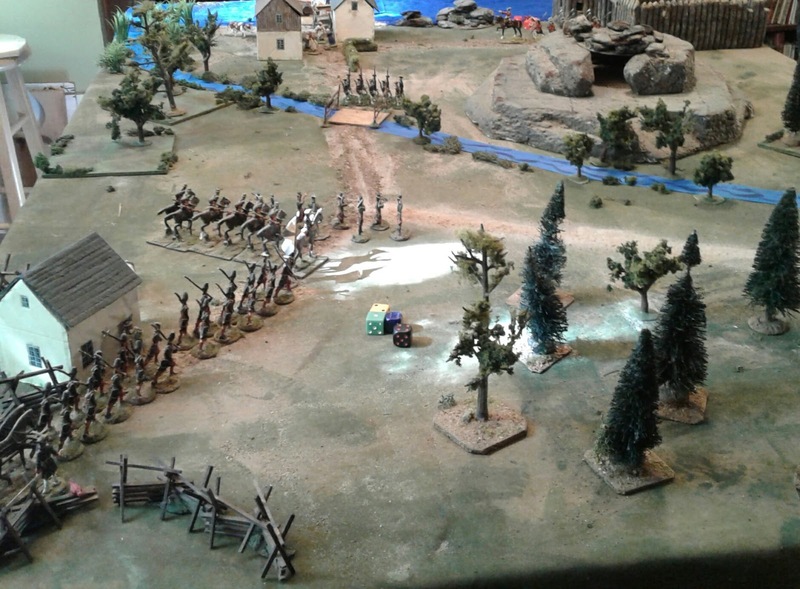 Jeff's 15mm ACW on his homemade hex mat. There are no formations in Battle Cry but that didn't stop me. Fast and bloody. The details of the rules may seem questionable at times but the result today was close enough to historical and it was fun. The question now is "Will my new Red regiment see any Elephants on Sunday?". I certainly hope so! OK so I'm not technically a Dad, but I look after a pack of hounds as well as a couple of cats and a bird, soooo...... I took some time for a quick Father's Day game. Despite my best camera instincts, this shot is surprisingly true to the actual colours on the table. My original idea was to do a big MacDuff game but there were other things (chore type things) and I didn't want to mess with any campaign backstories. I also didn't feel like playing MacDuff which is a different matter. Anyway, the lads from Faraway and Oberhilse are always up for a brawl. Since the OHW wargame scenario was still 3/4 set up, I just went with that, with a terrain tweak, and improvised rules as I went, sort of a retro-single figure version of Hearts of Tin: variable moves, turn initiative, detached unit command roll, firing by individuals, and a return to a morale roll for under strength units. Mid game. One attack on the house has been repulsed, the next will succeed but too little too late at too high a price. Pity there were no War Correspondents present. It all kinda worked pretty well and entertained me. I occasionally missed the grid for measuring but enjoyed the flexibility of no grid. Meanwhile, bubbling away in the back ground. After a thorough examination of various organizational and rules options for this upcoming campaign, I have decided that the optimal choice is to conform with my existing Charge! units and work the rules and scenarios around that organization. 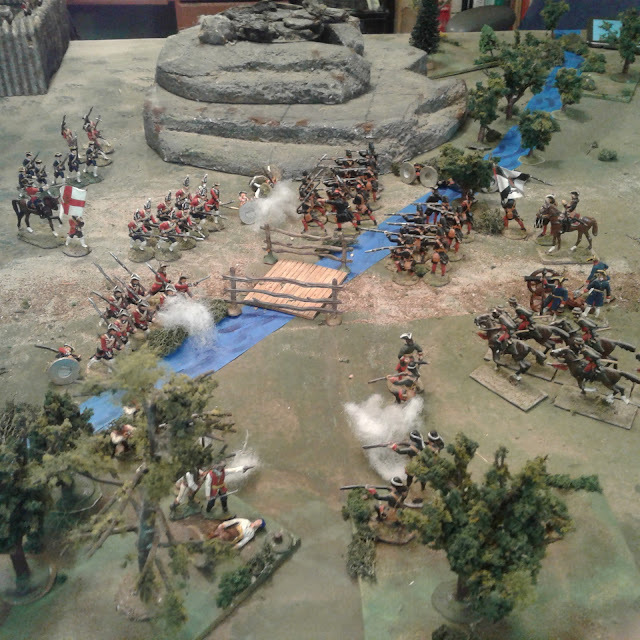 I envisage most games being skirmishes, like the most recent game , and the "Anything to Declare" New Year's Eve 2012 game (shown above), with around six units and detachments per side, with the occasional pitched battle game, like the 2012 Wentworth Pass game (shown below). having double or even triple that. 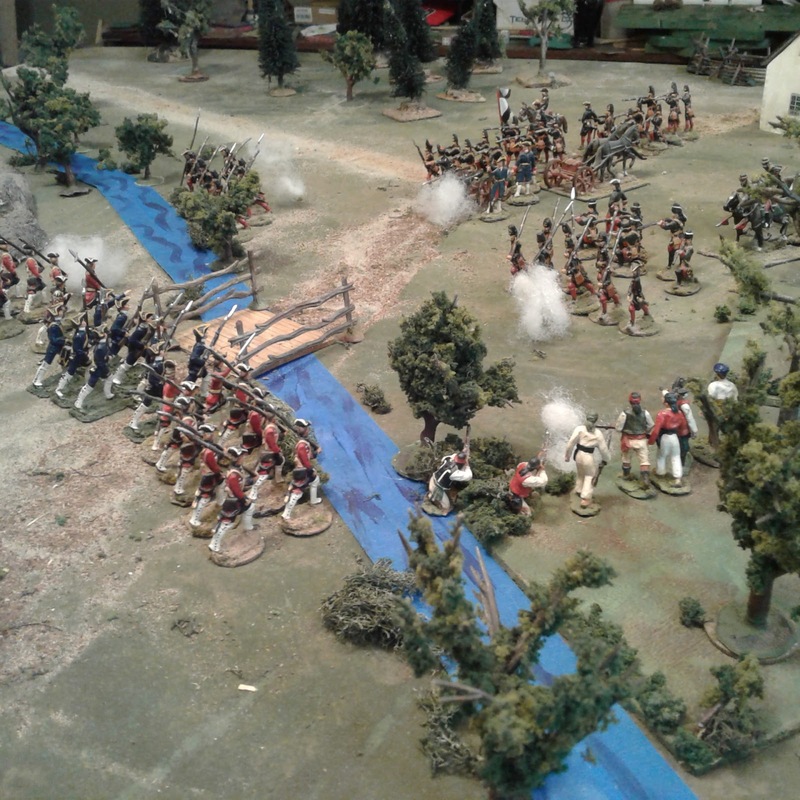 The Battle of Wentworth Pass from 2912. To be more specific, each of my Charge! Regiments which are formed by two 19 figure "Companies" plus an HQ group will form a "Brigade" with two 18 figure "Battalions" plus an HQ including the colours and drummers. I will also allow small detachments for garrisons, wagon escorts and the like. For light infantry, I plan to add three command figures to each Charge! company and field them as two nine figure detachments. These are of course paper strengths. The Old King's Brigade, 15 year veterans of many a stricken tabletop, using temporary movement trays. Use Lawford and Young's "Charge!" Update the 20th Anniversary edition of "With MacDuff to The Frontier" to include explicit "Skirmish" and "Battle" options as I was considering in 2014. Luckily, since these rules will both work with my organization and basing, the choice may be made game by game according to my mood and the scenario. It has long been obvious that, as in most things in life, when painting miniatures I tend to follow my instinct without much discipline or attention to various schools of technique. I'm usually happy with the results but I'm sometimes at a loss to explain what my "technique" is. If caught off guard I might mutter something about Old School but having recently gone back to check some old school books, well, it isn't really, but its not Middle or New school either. Its just.. "what I do". So, I decided today to have a "look-see" in an attempt to trace the roots and to take a few shots of today's batch. My first step was to look through several of my early wargaming books. There, right at the beginning of my wargaming life, was Don Featherstone's 'Battles With Model Soldiers' which taught me to glue a bunch of figures to a stick, something I still do most of the time, as well as teaching me what Jack Scruby called "sloppy undercoat, careful over coat", which is to say, slop on the main colour being more concerned with not missing any spots than with straying over the line. The next colour will take care of the edges when it is carefully applied to the smaller area. Then I have a vague memory of a Heritage/Hinchliffe catalogue painting guide in the mid-70's which recommended an overall dark wash. I no longer have the catalogue and don't remember exactly what it recommended but it was shortly after my one trip to the UK where I'd had a chance to see Peter Gilder's Huns in action and it was the start of a long habit of burnt umber washes as the last step before varnishing. But that's about it for wargaming influences. I can remember being impressed by my friend Eric Ritchie's painting 25mm ancients by a series of washes over white, but that's a technique that doesn't allow errors and I'm all about errors and do-overs, so I never got far with it. Similarly I tried black under coat and building up solid colours to build depth in the 80's but though I was happy enough with a few characters and a few units in both 15mm and 25mm, I found the process tedious and the end product still felt dark to me no matter how bright the highlights might be. I went back to my old ways. Sloppy main colour over white craft acrylic paint used as primer. 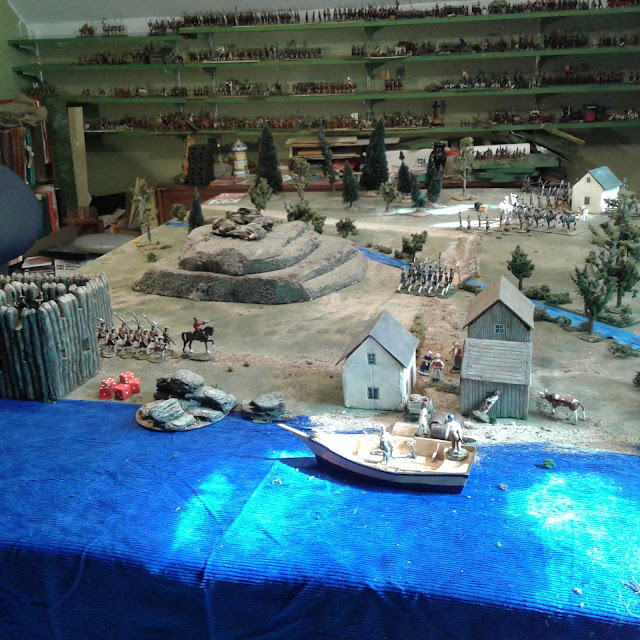 However, I was a painter and a converter of Model Soldiers for display before I was a wargamer. I still have my battered copy of Peter Blum's "Model Soldier Manual" from the early 70's. Although I haven't looked at the booklet much in decades, that's because the basics were well absorbed. While I don't attempt the sort of detail that a teen age me attempted on 54's, and don't do as much shading and highlighting as I used to do even 10 years ago, the basics of my technique are all there, white undercoat, base colours then shading blended in . Awaiting the shading process but my brand of stripped down glossy toy solderish style will only include some shading on the flesh, around the belts, the folds and under sides of arms etc of the coat and small clothes. I'm told that a well pointed brush is essential to a good paint job and from my limited experience with pointy brushes I'm sure it's true but, alas, I wreck them too quickly to find out for sure. So this 1 brush did everything except the white under coat. The final influence was much more recent but just as important, Shep Paine's "Making and Painting Scale Figures". At least it feels very recent but it would appear that 25 or so years have slipped past since I picked up a copy. How did that happen? Anyway, there was nothing really new about painting in it really, it was from his sculpting tips that I learned the most. He did have several observations on shading that went a level up from Peter Blum and he commented on the advantages of separate washes for different parts of Wargame figures instead of a single dark wash. As he points out it is a quick technique so doing several doesn't take up a lot more time but it really improves the look when wash style shading ties in with the colour being shaded. He was right. So, for this lot the flesh was shaded with a very thin flesh + burnt sienna, the coat with a red+burnt umber, etc. Not washes though, these craft paints don't run well enough without an additive so I use older techniques of applying a dark shade then adding a bit of water and running the edges out a bit to blend them in with the base. Shaded, glossed, and fallen in with the first batch of recruits. Last but not least, one of the best tips I ever got came about 20 years ago from Al Fisher on the Yahoo Littlewars group: "Don't look at where your brush has been, look at where it is going". It sounds odd but I've been taught the same thing in drawing with a pencil. In other words, if you are looking at your brush tip, its too late, its already there and left paint behind. If you look a little bit ahead of the brush to where you want it to go and trust yourself, your hand and eye will guide the brush from where it is to where you want it to go leaving a line behind it, just where you wanted it and less halting and wavy that if you'd been looking at it. But you need to keep moving your focus point as the brush moves until you reach the end. I still catch myself NOT doing it and have to correct myself. Never to late to learn and experiment. At last I managed to take a brush to some of the new Prince August SYW French. They are delightful little models! I had intended to do a straight glossy toy soldier look, block colours, no shading etc but the sculpting was too crisp to get the right look easily so I compromised on a little bit of shading, not too much and no highlights, then the gloss. Sort of vaguely Old School but not quite, sort of like my games. Anyway, I like 'em and am looking forward to painting more. Recruits for Lally's Irish Regiment drill on the lakeshore. After hours spent combing books and the net and once again lamenting my MIA Lace Wars volumes, I decided to start painting red and green and then decide if they would be a fictional unit based on Polish War of Succession Saxon or Danish or would be Irish. It didn't take long for old habits to kick in (though not my old eyesight -they were 1/2 done before I realized I had grabbed several grenadier heads with mustaches OOps! Oh well!) and since my original NQSYW units were all painted for Fontenoy I just went ahead and painted them Lally's. Anyhow, I also got a start today on a map of the seas and lands North and East of Rosmark. Progress continues and enthusiasm mounts! 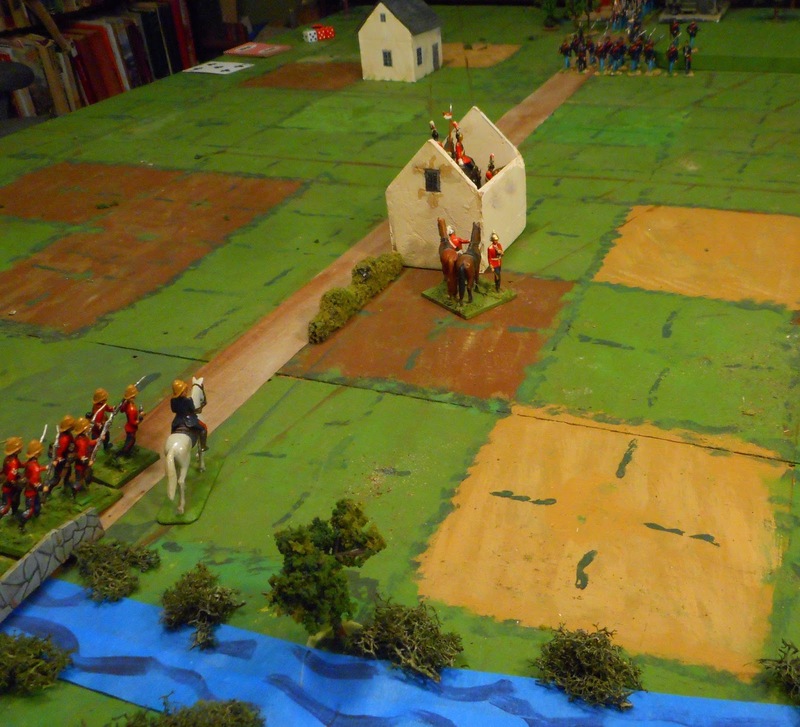 Yesterday as I was clearing the table the idea popped into my head that I should give MacDuff a go at a One Hour Wargame scenario and that I should try an 1860's "Colonial" game. I haven't gotten around to building my planned colonial native forces yet but I scrounged enough of the Brethren of the coast to give it a go. The scenario (whose number I would have to look up) was a surprise attack by the Queen's troops to seize a bridge. Both sides had a stream of reinforcements rushing to the field of battle. As is my custom I rolled twice on the 3 chart rather than once on the 6 chart. The Queen fielded 3 Infantry units with rifles, 1 unit of Light Infantry with rifles, 1 Naval gun and a unit of Lancers. The Brethren had 3 units of massed irregulars with melee weapons and a handful of muskets, 2 units of light infantry with rifles and a gun. The Brethren obviously had a chip on their shoulder about being ripped off their bases then left to moulder on the shelf for months because they rolled like fiends while the red coats were a bit rusty to be kind. The game lasted a bit over an hour, maybe 90 minutes (It was interupted by various things as chores and supper.) and was OK. Yes, just OK, in part because I had trouble getting a handle on the narrative and what exactly these units represented, partly because I rubbed up against several of the grey areas such as group moves where I had gotten no farther than deciding that they needed some more thought and improvement and partly because of the disjointed nature of the card initiative by unit without some sort of leader+group cohesion rule. Still, it was OK with some tense moments, some good and some bad luck, some tactical errors being punished and some but not all bold risks paying off. Once again the Black Fox maintained his reputation as a bold and successful leader. The 3rd rush, with the Black Fox in the thick of it has cracked the centre and it was all downhill from there. I don't think Larsen's Lancers have ever had an unluckier day. However, what this game did was bump me into spending yet more time thinking about what I was trying to achieve and revisiting various appropriate historical actions of the very small to small size to picture what they would look like as MacDuff scenarios. The games have convinced me that the rules need to be expanded again and a lot more explanations and examples added. I also need to translate the sort of impromptu decisions I tend to make mid-game into distinct, clear, written rules. That sounds like a lot of work and led to two more questions: "Are these going to be the rules that I would most want to use or the rules I use because I wrote them?" and "If I put that much work into them including scenarios, sample translations of historical actions into wargame units, notes on my philosophy and so, should I then capitalize on the work by going the self publishing route?". The first question is as yet unanswered beyond thinking that if they would not be my first choice without radical changes, this may not be the best use of my time. The second question depends in part on this being a set of rules I believe in and want to use myself and but also on looking into copyright issues since they were originally published in the Courier. In truth though I tend to prefer playing games at a slightly higher level than MacDuff was theoretically designed for and which play faster. That's why I originally wrote Morschauser Meets MacDuff, which became Hearts of Tin, and I've found myself thinking about those rules during both of the last games. A battle like Crysler's Farm or La Belle Famille (Niagara) is supposed to be pushing the high end for a MacDuff game but should be a small to average Hearts of Tin game. It is possible that MacDuff should be left pretty much as is and I should focus on a "final" polished version of Hearts of Tin. I'm going to have to brush off one of the old versions of Hearts of Tin (HofT) and try a NQSYW game with them before I go much further. Not only did this game help me to decide some rules questions, it also helped me make some campaign decisions. A standard NQSYW Charge! infantry company is 16 privates, an officer, a sergeant and a drummer or 19 figures while a standard MacDuff infantry unit is between 8 and 12 figures although a full Charge! company would work if I was using smaller figures or a bigger table. It occurred to me that by adding 1 extra officer per company each of my Charge! companies could provide 2 MacDuff companies of 10 figures. Each of my 2 company NQSYW regiments could thus provide a full 4 company MacDuff Regiment. Thus it was that for the first go round with the scenario, the one in the teaser, each side had one battalion with 3 or 4 companies on a single card as well as individual light and artillery companies each on their own card. It was a pretty good game despite some rules blips that had to be settled, but as so often before when playing this sort of game, I occasionally got confused about when a company was a unit and when a group of companies was a unit. Past attempts to not only write this up in a clear concise manner but to also apply the rules evenly during games has always been an issue. That is why I eventually gave in and dropped the battalion rules until the 20th Anniversary loomed. Early in the dress rehearsal. So I reset and replayed the scenario with 12 figure units, each on their own card. The first game had been good but the second one was better. This was the game that I chose for the battle report. But how did that organization compare to historical battles of the right size? I hit the books looking at historical scenarios of the right size such as Belle Famille (Niagara), Crysler's Farm and others. Sure enough, the evidence supports a tendency for detachments to be made before a battle rather than during it and they don't usually rejoin during a game. More than that it seems not uncommon in small battles for battalions to be split before the battle while several small detachments might be combined. Excellent, the ground scale indicates that each of my companies really represents 2 or 3 real ones anyway. Anniversary edition or not, that whole multi-level unit thing can be dropped in favour of variable sized units. I may end up losing the special Colour Party rules or at least modifying them. 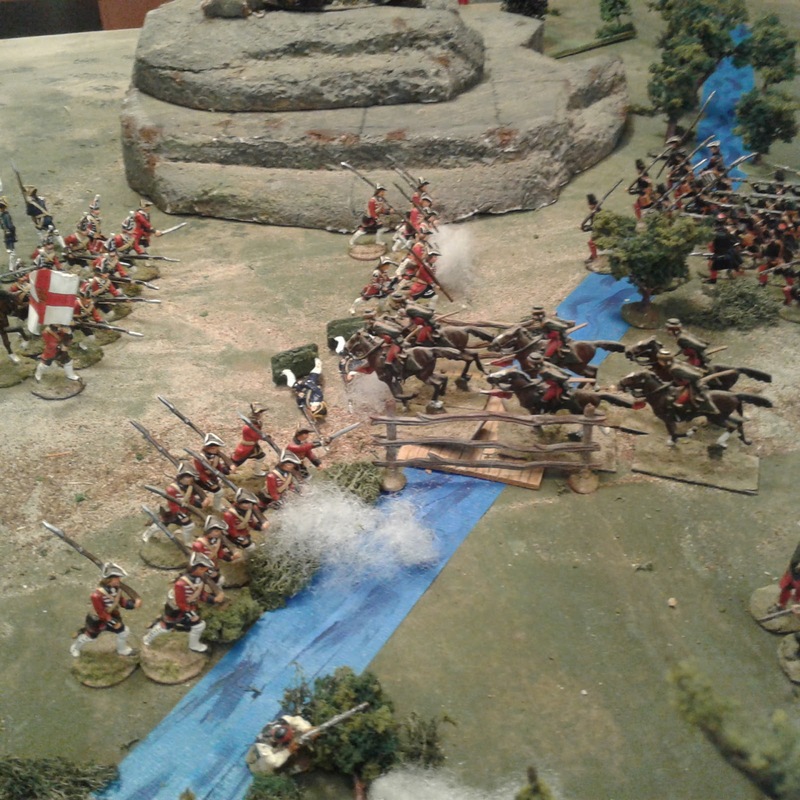 Mid-game the lancers charged over the bridge breaking the Picquet which was down to nearly 1/2 strength but declined to pursue into the fresh Grenadiers. BUT, how will this mesh with my NQSYW organization? Well, I could still go with 10 man companies if 19 is too big but the more I think about it, I'm not likely to ever need to haul all of my NQSYW units to a convention game and the next one is probably at least 2 or 3 years anyway. 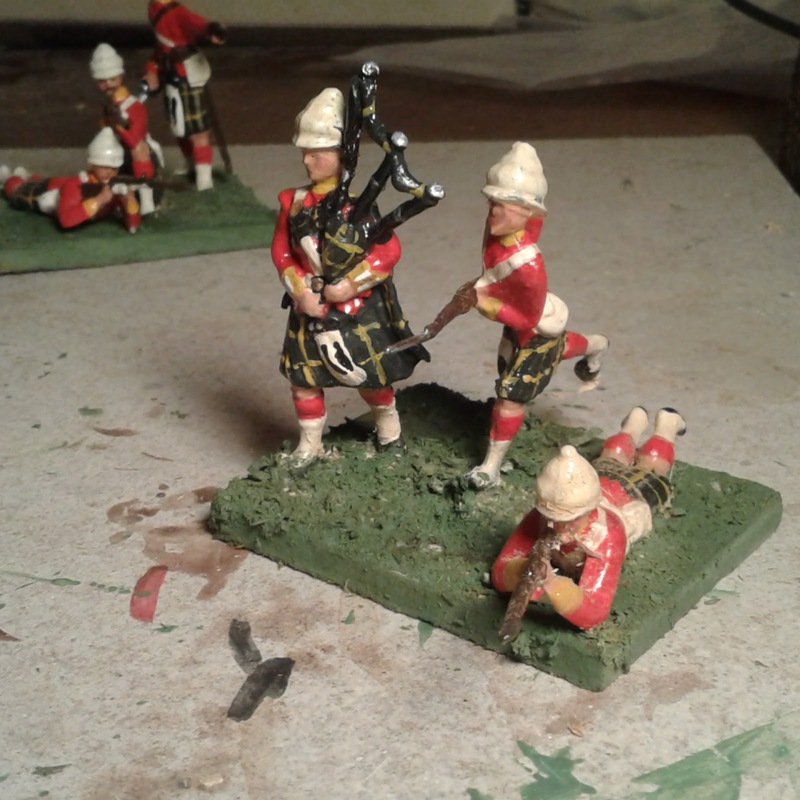 So I will just paint 12 man MacDuff units now, probably in pairs, and worry about it later should the occasion arise. The whole convention topic then led me to think about whether I would ever want to take a scenario set in this fictional campaign setting to a convention or would I rather take it as a fictional scenario in an historical setting? I'd been looking at Danish and Saxon uniforms as a basis for a non-British army in red but since many of my NQSYW units are actually painted as historical units, the thought struck me that I might as well keep on doing it and leave my options open. A push over the stream by a two companies of Pandours highlighted the question of whether or not the two companies counted as 1 unit or two for being broken. In the end the attack took so many hits it didn't matter and a last ditch charge by the 4 remaining lancers failed to retrieve the day. What follows is an extract from MacDuff's "Illustrated History of the First Furland War" . Once the picquet on the bridge opened fire on the approaching Chasseurs, any hope vanished for a peaceful resolution to the confrontation between the Duchy's mercenary garrison and the King's Advance Guard. "It was on the 6th of June that Colonel Konrad led his Pandours out of the North Pass and appeared just south of the little port of Newlanding. The settlement at Newlanding is small and only the presence of a small Duchy fort gave any hint of the outport's importance. It is the only seaport East of the Hye Mountains and west of the Great Marsh. The port is connected by road both to the North Pass which leads to Rosmark during the eight months of the year when the pass is clear of snow and to the villages scattered throughout the interior of Furland. The Colonel's orders were to seize and hold or destroy the bridge over the Blough Taip* to prevent all trade not licensed by the King." *Note: Many large streams and small rivers in Furland are called Taips by the settlers. It is derived from the native term Tae Ap or fast running water. Unable to stand the combined fire of the Pandours and Konrad's artillery, the bridge picquet fell back as the relief companies arrived. "As reinforcements rushed forward, a bloody firefight developed with heavy losses on both sides. The King's Pandours seemed to be made of sterner stuff than their Irish mercenary opponents and time after time their companies reformed after heavy losses and returned to the fight. " In the face of a fierce fire from the Irish Grenadiers, supported by local volunteers, the Pandours begin to waver. "Finally Colonel Konrad stirred himself. He sent his lancers over the Taip to flank the stubborn Irish Grenadiers and led his last reserve forward for an all out assault. " Victory hangs in the balance. "The Lancers dashed across the Taip at a gallop but were met with a hail of roundshot from the fort's artillery and a volley from the rallied piquets and were driven back. Under a hail of fire from the Grenadiers and Volunteers, the Second Company of Pandours began to waver and Colonel Konrad had to rush to their head and hold them to their work with oaths and coarse words amidst a cloud of smoke." "The steadest volley of the battle then erupted from the two remaining Pandour companies and the Grenadiers broke and ran. A round or two from the gun was sufficient to send the remaining Picquets flying back to the fort while the volunteers ran back to get their families and valuables on board ship." With the bridge destroyed the Pandours fall back. "Judging his remaining force insufficient to take the fort or silence the guns and uncertain of what enemy reinforcements might arrive by sea, the Colonel ordered his men to break down the bridge which they did under a desultory canon fire. With that done he retired to the crossroad and made camp." A rainy Saturday? Perfect. Time to let MacDuff out for some exercise, just have to pick a scenario and grab some units. Now, no more Acadia, this will be using my Rosmark troops against...ahh.....hmmmm..uhhh...oh. The planning hasn't got that far yet. Hmmm. After rejecting various scenarios and since I was tired and fuzzy headed, I decided to nip out to the shed to cast up some of the new PA French and then do some painting instead of playing a game. Once I had enough figures for two MacDuff companies, I started thinking about uniform colours, choice of hat styles and campaign factions. Which side are these going to be on now? Will they be regulars or militia? Bright Harbour on a June Afternoon. Wargaming in a known setting is so easy. You've got a selection of units from known opponents, just plunk 'em down and this little skirmish won't affect known history. But with a not yet defined campaign where you're not even sure who is fighting who let alone what their uniforms are, well that's a different matter. Every skirmish and battle to date has affected and shaped how the backstory has developed and its all on record and so will all future battles. Some days it does seem as if I like to make life difficult for myself. Keeps it interesting though. After a considerable period of pondering uniform colours and hat and coat styles as well as my stock of moulds and planned, possible future purchases, I decided this all needed more thought and planning. So far, all the Rosmark Wars of Succession games have been fought using my normal Rosmark units on both sides. Going ahead I would like to develop a distinct style for each opposing faction without negating any of the reported facts to date if possible. a) Have all native troops on both sides continue to use French styles with mercenaries and allies in foreign styles and with a mix of coat colours on both sides. b) Reconcile the Maritime Duchies with Rosmark and invent a new enemy in distinct uniforms. c) Return all the original Rosmark (French) units to the King leaving only the 2 units of brown coated militia which used the old PA Rossbach generic musketeer figures with open coat and some cavalry and gunners, then add new Maritime Provinces units from new Austrian and Prussian moulds reinforced by British should they appear. Somewhere East of the great Hye Mountains, a detachment of the mercenary Irish Regiment, still in the pay of the Maritime Provinces, form the garrison of a fort guarding a Maritime Province trading post. All is quiet until a column of the King's Pandours appears from the road running West through the mountain passes to Rosmark. Rosmark is at peace, what does this mean? The long roll sounds and the garrison turns to.